The Michigan Wolverines football program represents the University of Michigan in college football at the NCAA Division I Football Bowl Subdivision (formerly Division I-A) level. Michigan has the most all-time wins in college football history and the highest winning percentage among FBS teams. The team is known for its distinctive winged helmet, its fight song, its record-breaking attendance figures at Michigan Stadium, and its many rivalries, particularly its annual, regular-season-ending game against Ohio State, once voted as ESPN’s best sports rivalry. 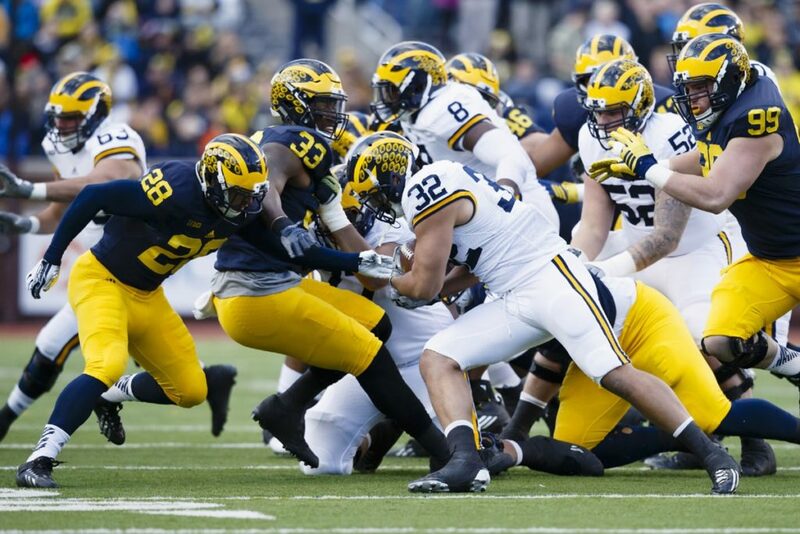 Michigan began competing in intercollegiate football in 1879. The Wolverines joined the Big Ten Conference at its inception in 1896, and other than a hiatus from 1907 to 1916, have been members since. Michigan has won or shared 42 league titles, and, since the inception of the AP Poll in 1936, has finished in the top 10 a total of 38 times. The Wolverines claim 11 national championships, most recently that of the 1997 squad voted atop the final AP Poll. This entry was tagged Michigan Football, Michigan Football 2017. Bookmark the permalink.